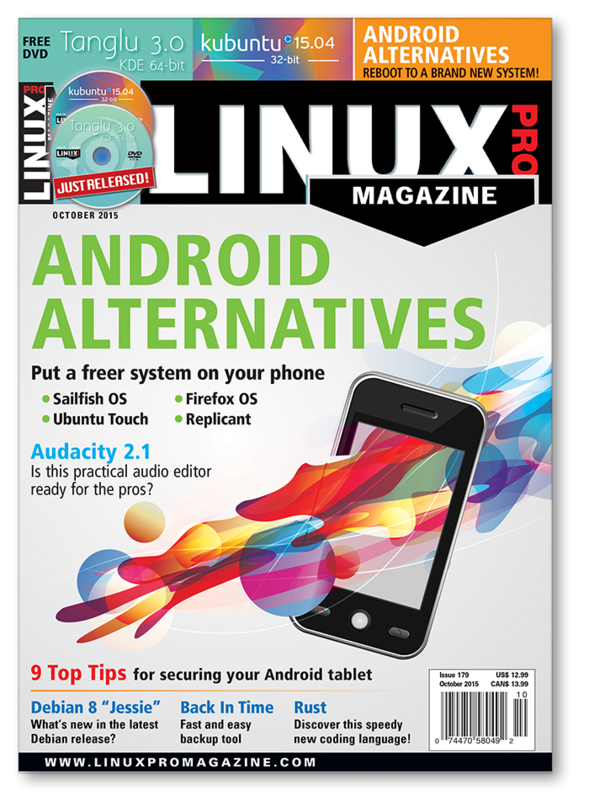 In this issue we discuss Android Alternatives and how to put a freer system on your phone. Important tips for securing your Android tablet. Browse and install open source Android apps from this alternative repository. We take a look at this free Android OS. Sailfish OS, Ubuntu Touch, and Firefox OS mobile operating systems vie for a piece of the smartphone market. We test these mobile alternatives on a Nexus 4 phone. Tool tests on the fast track. The new version “Jessie” updates numerous software packages and moves to systemd. Apache Software Foundation manages hundreds of major software projects and thousands of developers. A fast, frugal distribution with its own package manager and repo. NVidia graphics problems and setting up an FTP server. Prevent automatic fallback to the vulnerable SSL. Streams and operators and pipes, oh my! A deceivingly difficult math problem solved with Perl. We look at a few features of Mozilla’s systems programming language, and its similarity to other languages. Check and modify the tunable parameters of ext filesystems. Generate e-books from Markdown-formatted text files. Simple backup for ext4 and Btrfs. Convert time to the irreverent Discordian calendar. While attending DebConf15, “maddog” reflects on the remarkable organization and people of the Debian community. Zack scrutinizes Kernel communities, conundrums, and controversies. It could take up to 4 weeks depending on your delivery region.